Four weeks ago today, we were making final preparations for our trip, getting the condo in order for a month away and provisioning the boat accordingly. Three weeks ago today, we sailed from Ludington to Frankfort. Two weeks ago, we dug around Beaver Island in a GeoTracker before an evening sail to Charlevoix. And a week ago, we made it to Pentwater just before the rain descended again. Aaron sailed Clarity back to Chicago on a 14-hour solo crossing from Holland this past Wednesday, and I drove the three-and-a-half hours back with Claire. We will be here next week. And the next. And the next. I am already mourning the end of our trip. I remember when we returned to Chicago last year after our month-long cruise, it was an odd transition back to our “normal” routine. But after some challenging times out on Lake Michigan, it was partially a welcome one, if only to recharge. And we still had the rest of summer in Chicago to look forward to, which is pretty amazing in itself. We started this year’s journey two months later than last year’s. A polar vortex descended on us halfway through, not to mention that a lot of shops and restaurants in the port towns reduced their hours or shut down completely after Labor Day. It all made this feel like the end of the sailing season, not just the end of our trip, though the Chicago marinas stay open through Halloween. This year, I truly didn’t want the trip to end. Sure, the weather wasn’t ideal, but we didn’t experience any of the boat issues we had last year, and since this wasn’t our first rodeo, we worked even better as a team. One of the things I try and explain when people ask, “So how was the trip?” is, when you’re gone for three to four weeks, it almost ceases to be a trip and just becomes your lifestyle. The Downey family settled into life at sea fairly early on in our travels. Aaron worked, I worked, we traveled from one place to the next, Claire was a learning sponge as we explored new places as a family. And that’s the other part that I miss dearly when these trips come to a close – the time together as a family that isn’t relegated to just weekday evenings and weekends. It’s an absolute luxury – not just because I know Claire benefits greatly from interacting with both of us, but because Aaron and I get to show her even more how we respect each other, depend on each other, work together, and cherish our family. We still have quite a few more weeks to live part-time on Clarity at 31st Street Harbor, but I know the only thing that will get me through another brutal Chicago winter is planning for next year’s adventures: getting a dinghy so we can anchor out rather than always docking in marinas; getting solar panels to generate our own power; cleaning out our water tanks, which we have yet to use because I’ve been spoiled with on-shore water; putting in a swim platform with an outdoor shower; and many other projects that may come to fruition and may not, depending on budget and priorities. We’ve talked about starting earlier next year and going longer, exploring the Wisconsin coast instead, sailing up to Door County and digging around the peninsula, crossing over to Michigan’s Upper Peninsula…. When you get a taste of something extraordinary, it’s never enough. **Many thanks to our dear friends, Dawn and Jack Draper, who took this and other amazing photos of Clarity as they sailed alongside us on their boat, 9-to-5, from Muskegon to Ludington. Mother Nature and Lake Michigan have not been particularly friendly to us this week, as we’ve been slowly but surely making our way south. Cold, dreary, rainy, foggy – all those attributes you look for in a lovely September sail! It’s been highs in the 50s during the day and lows in the 40s at night. As I wore the same pair of pants three days in a row because my other pair was already in the laundry, I learned that I didn’t pack appropriately. And investing in foul weather gear might be a good idea before next year’s cruise. Helly Hanson, do you also make sets for toddlers? After a bear of a day sailing to Frankfort, we had the same conditions all the way to Ludington the next day, and then we got socked in for two days as the wind howled and the waters got angry. The middle of the lake saw 18-footers on Wednesday. Tucked in safe in sound at Harbor View Marina, we enjoyed the library and the cozy fireplace, though we were bummed that the hot tub was closed for the season. On Thursday, Aaron’s mother, Penny, and her husband, Brian, visited us with the best gifts we could hope for – jars of homemade chili, cornbread muffins and freshly baked chocolate cupcakes. We dug around town with a stop at the library (one of the best around for kids), ate some ice cream at House of Flavors and shared dinner on the boat before they headed home. Friday, we caught a window before more storms set in and sailed to Pentwater. Our friends Jack and Dawn drove up to join us for dinner at the yacht club, and then we joined them at Muskegon Yacht Club, their home port, the next day after a six-hour sail. Hours of chats, laughs around a bonfire – they’ve become fast friends that I know will be friends for years. Then today, it was on to Holland. I was looking forward to an easier sail – the last two had been rough, as the lake hadn’t calmed down after the cold front settled in. All of the forecasts called for waves of 1 to 2 feet, and the sun started shining just as we cast lines. Finally, a calm, sunny sail! Well, as can happen, the forecasts were wrong, and as soon as we were halfway through the channel and headed out to the lake, it got lumpy. We sailed 2- to 4-foot waves with 10- to 15-knots of wind the whole way down. And a miracle occurred. I didn’t feel sick. In fact, I loved it! For the first time, I was able to fully enjoy sailing in those conditions, the jib out, us hauling down the lake, riding the waves at a 15-degree heel. It seems that my exposure to longer sails in waves has helped me curb my symptoms. Maybe if we lived full-time on our boat year round, I’d get to a point where I don’t get seasick at all :). With two days in port due to wind and waves, we found plenty of ways to entertain ourselves. What is this amazing creation? And I get to eat it?! One of the best around! We just can’t seem to escape sailboats. Our slip for the coldest night of our trip – 44 degrees and rainy! This yacht club has the best play space for kids that we’ve seen! Heck, I wanted to play in here, too! During dinner with Jack and Dawn at Pentwater Yacht Club, Claire insisted on cuddling with Dawn for the whole meal! Aaron captured this amazing shot just after sunrise. I was still snoozing :). Three Ports in Two Days! Four days into our trip, and already plenty of adventures! Clarity is currently docked at the Muskegon Yacht Club, though that will change in another 10 hours or so. 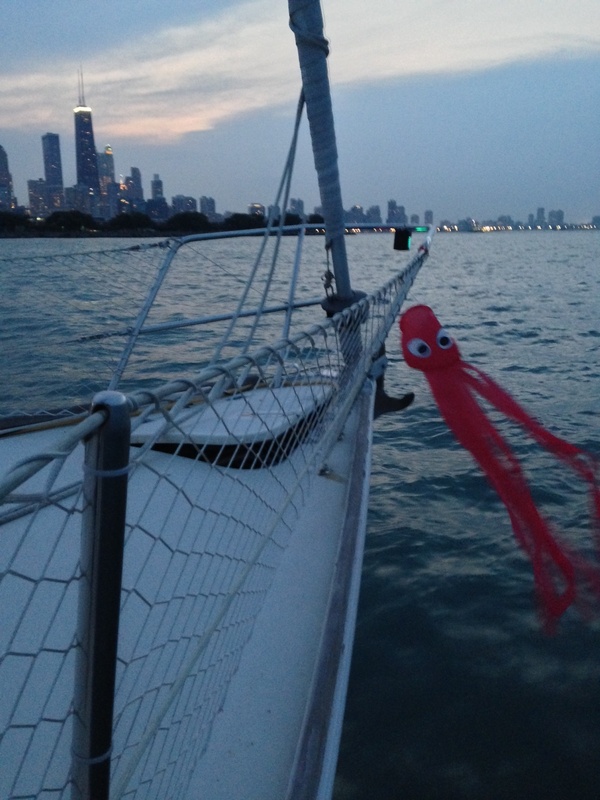 Aaron’s sail from Chicago to Holland on Sunday took just more than 13 hours. 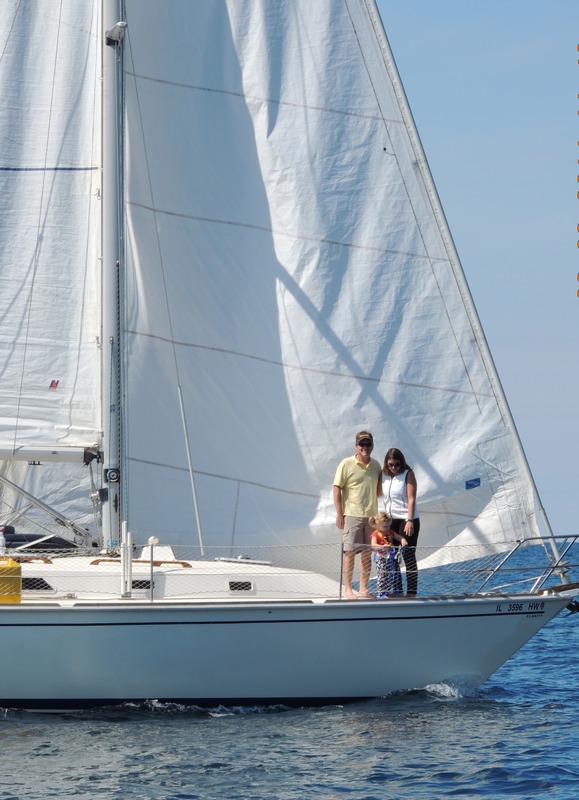 Luckily, the sail was relatively uneventful, and Claire and I also had an easy drive up to Grand Rapids the same day. We stayed with my mother-in-law, Penny, and had wonderful family time Sunday evening and all of Monday, when Aaron was able to join us. We also ate so many delicious homemade meals that I thought I might burst. My mother-in-law is an amazing cook and an excellent baker. I think she made five pies in the two days we were there. Many thanks are also due to Penny and Brian, her husband, for all of their help. They watched Claire while Aaron and I both got some work deadlines out of the way, and Brian accompanied me on my epic shopping trip that afternoon to provision the boat as best I could for the next few weeks. On Tuesday, Penny and Brian drove us to Clarity, where we waited out a storm before making the decision to set sail for Grand Haven. Also, after yet another failed nap attempt, Grandma and Grandpa offered to drive Claire up to Grand Haven to meet us. The change in routine had wreaked havoc on Claire’s sleep. Too many fun things to do with Grandma and Grandpa! I don’t need to nap! Sleeping through the night? What’s that?! But we knew that once we got into a routine on the boat, she’d fall back into place. And for the most part, she was in great spirits. The sail up to Grand Haven just the two of us was a great introduction to our trip. The sun came out and we were able to sail without the engine a little more than half of the way. Claire actually napped for Penny and Brian on the drive, thank goodness, and we all had dinner together in town before getting Claire to bed on the boat – just in time to catch the musical fountain show, which is exactly what it sounds like. As much as I roll my eyes about how silly it is, the show is a cute idea for a seasonal town, and they’ve made some improvements to the lighting and sound since last year. Claire would dance her heart out to it – maybe next year, when 9:30 p.m. isn’t so far past her bedtime. Penny and Brian headed home and we started sawing logs shortly thereafter – all the way until 10 a.m. this morning! Claire and I dug around downtown Grand Haven for a bit while Aaron tended to some work calls, and after a stop in Oddside Ales, our absolute favorite local haunt, we packed the boat up again and set sail for Muskegon. Claire napped about half of the three-hour sail, and even though the wind shifted onto our nose halfway there and the waves steadily built, our first family sail of the trip was a memorable one. We grabbed a slip at the yacht club, home to just about the nicest people on earth, and Aaron took Claire for a dip in the pool while I got dinner ready. Tomorrow, our plan is to keep heading north while the weather conditions cooperate – either Pentwater or Ludington, depending on how ambitious we feel. Our slip at the Grand Haven Municipal Marina. Great location! Terrible facilities. A quick snack at Baker’s Wife, one of my favorite Grand Haven stops. Their homemade pretzels are downright decadent. Claire made some new friends as we perused the shops on Washington Avenue in downtown Grand Haven. Some of the local wares. We find sailboats everywhere we go! More than 20 really interesting microbrews and the most laid-back crowd around. Claire stacked dominoes while Aaron and I enjoyed a brew at Oddside Ales. Taken during the sail from Grand Haven to Muskegon. It was really blowing! Claire was thoroughly entertained watching the lighthouse as we came into Muskegon. 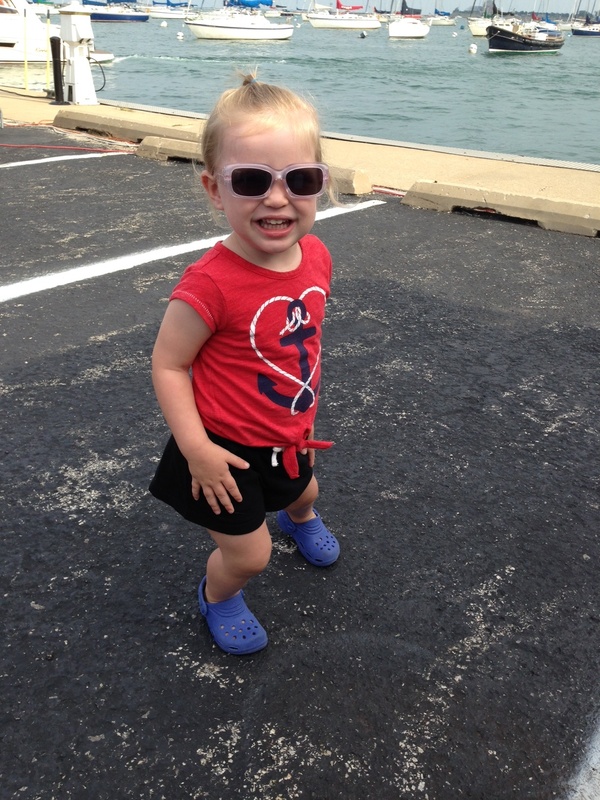 We made it to Muskegon Yacht Club in just enough time for Claire to head to the pool for a swim before dinner. You know you’re a cruiser when one of your boat projects is fishing Mickey Mouse figurines out of the table stand in the salon. Please be a witness to this organized (yes this is organized) fully stocked fridge! It will never look this tidied again. Finally this boating season, stars and schedules have aligned! Tomorrow, we cast lines and head to Michigan for three or four weeks. The plan? Live on our boat full-time, make our way north and see as much as possible before throwing the trip in reverse. We are so excited and blessed to be able to do this. Also, the decision to pull the trigger and go was not one we took lightly. Interested parties can find any number of sailing blogs out there, though I don’t know of any others focused on sailing the Great Lakes with a toddler. But many families are cruising the Caribbean, or even circumnavigating the globe, and documenting their experiences. I’ve actually gotten frustrated reading some of those blogs lately. The pictures are beautiful, and the stories are alluring! But I don’t find them altogether honest. I’ll always be honest here. Aaron and I had countless conversations about whether or not we should take this trip – not because it wouldn’t be an amazing experience, but in order to make sure we really wanted to take on all of the extra weight that comes with it. Last year, we did a similar trip, and for a similar length of time, so we have a pretty good idea of what we’re in for. With any sailing trip, though, there’re bound to be surprises. What if weather and waves kick up while we’re sailing? I will likely get seasick, though I’m finding better ways to manage this. Also, if I’m sick, it’s almost a guarantee that Claire is, too. And then the bulk of the responsibility for sailing the boat and getting us safely to shore falls on Aaron. And that’s a heavy burden for him if I’m not at my best as co-skipper. What if Claire gets a cold while we’re gone? What if she enters another lovely phase of being 2 years old, testing even more boundaries? What if, an hour into a six-hour sail to our destination, she decides she wants off the boat? And then refuses her nap? What if we’re out and the autopilot quits? Or the steering fails? Or our engine or batteries shut down? Do we have a back-up plan for as many situations as possible? Are we prepared for emergencies? What if Aaron and I get into a fight while we’re out there? Clarity’s 36 feet can seem pretty cramped in situations like that, and it’s not as if one person can just go for a drive to burn off steam. And can we get things organized enough at home to be comfortable leaving for that long? What about work, for both Aaron and me? Oh, and somebody has to stop in on Tink regularly, too! Then, of course, there’s the financial consideration. Sure, we will be taking our “home” with us wherever we go, but unless we anchor out, we will be paying for slips in every harbor we stop at. These can run anywhere from $35 to $75 per night, sometimes even more, depending on if we stay in a relatively basic municipal marina or a fancy private one with a swimming pool and a hot tub (yes please!). The truth is, while we’re gone, we will be paying for our condo in Oak Park, paying for our slip at 31st Street Harbor, and paying for our transient slip. G. U. L. P.
I mention all of this to explain that, in order to do this, you really have to want to do it. And you have to accept the inevitable challenges of a trip like this – and embrace them! Luckily, Aaron and I are both realists, and at the same time, adventurists. With as clear a view as we can have, we are so excited that everything came together and we are able to “take to the sea” once again. Aaron will be sailing Clarity over to either South Haven or Holland tomorrow (something he felt was important to do on his own), and I will be driving with Claire to Grand Rapids to visit with his family for a day or two. Then, while Claire and Grandma have some bonding time, I will do my big shopping trip to provision the boat for the next three weeks. Aaron will likely take the boat one more stop up to Grand Haven and we will rendezvous there as a family on Tuesday, spending a day getting settled before pointing the bow north and seeing where the wind takes us. We will both be working remotely while we’re gone (how fortunate is that?!). There will be lots of adventures and lots of pictures – I’ll be sure to share them with you! And I’ll be taking notes on each port to create a guide for anyone who hopes to follow in our footsteps, either wet or dry, with their kiddos. Inevitably, there will be some trying times, and I’m sure we’ll get into some pickles. We always do. I promise to share those moments, too. Halfway through our seven-hour sail to Milwaukee, the sun broke through the clouds. Rained In – Time for Bananagrams! Play-Doh – a great way to keep a kiddo entertained in the cockpit for at least an hour! Claire was enthralled as they raised the Bayview Bridge so Clarity could pass underneath on the way to the marina. Yep, that’s a pretty good heel. Check out the water line. Making a full breakfast during our sail from Port Washington to Sheboygan. With a phantom hand – Claire really wanted that bacon! Want to read about our adventures when they're hot off the presses? Enter your email address to receive notifications of new posts by email.